As I’m approaching my pregnancy due date, I’ve been nesting like crazy. They say that’s a sign that labor is near, but I’ve been working on the nursery in our apartment for most of my pregnancy. After months of careful curating, I finally feel like it’s ready—though the baby is likely to spend the first few months to a year in a co-sleeper bassinet in our bedroom. Still, our former guest room is now something that both guests and I will enjoy as we spend time in here. We kept our day bed in there for the out of towner visits we have had and are still expecting. Even our guests have remarked on how cozy, calm and peaceful it is in the room, which was a goal of mine when decorating. I tried making the color scheme minimal and neutral with pops of blues to evoke nature and space, the themes of the room. Our baby’s grandfather (my father) was an aerospace engineer who worked on impressive projects in his career like the lunar module for the moon landing, which I featured in a couple of spots. In his retired career, he is now a painter, so I had him customize this artwork and frame to conceal the ugly air conditioner that would have otherwise been a focal point of the room. It’s also become the inspiration for the rest of the decor. Before we found out the gender of the baby, I decided I wanted a neutral color palette either way. The first things I purchased were the glider, jute rug and wood light fixture, all via Gilt. They were such great deals that elevated the space and totally made the room even before we told anyone that we were expecting. They’ll also have longevity even if we decide to redecorate for our kid’s taste down the road. 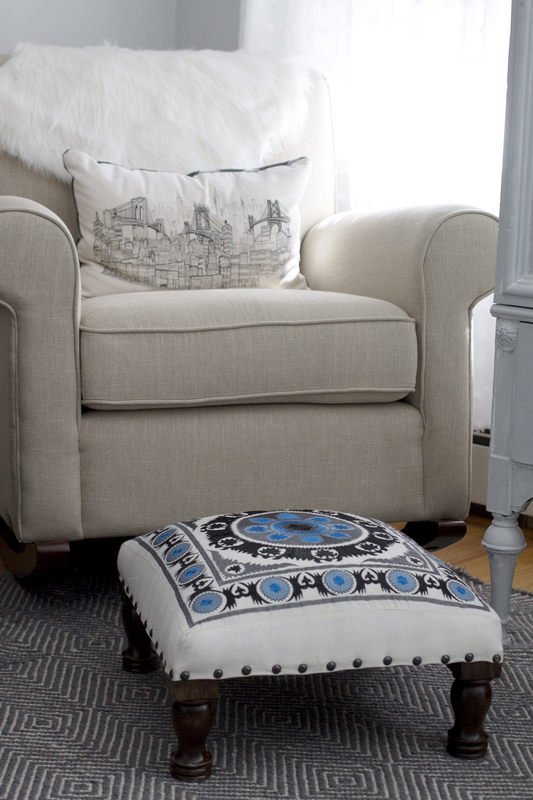 My sister handed me down a wood stool for breastfeeding, which will be useful, but I also wanted something I didn’t mind looking at every day, so I scored this embroidered Moroccan style one while I was shopping for a shoot in Homegoods. It’s now one of my favorite pieces in the room and it was only $30! Oddly enough, my breastfeeding / reading nook was the biggest challenge of the space, because of the lack of space. I was able to squeeze it in within a corner of the room between the guest bed and window. I ended up using an old table that I found at a garage sale years ago and painted with a distressed white paint. I love that it’s small enough, but still can store all of the books I want to keep nearby. 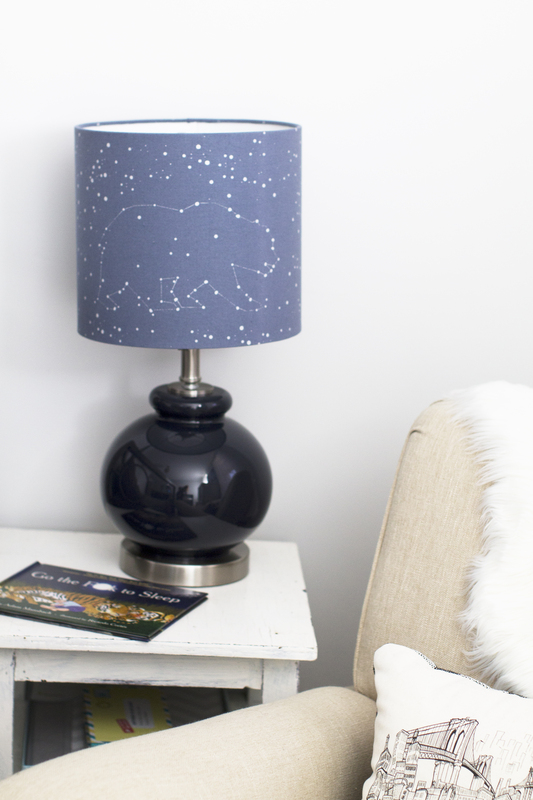 The toughest part was that I fell in love with this lampshade that was both on theme and playful enough for a kid, but I struggled with finding the perfect lamp base. After trying it on many bases that just didn’t do it justice, I took apart one I loved from Marshalls. It was so perfect…except that the shade wasn’t compatible with the way that the base was set up. Ugh. I ended up rigging it with wire because I was so determined to make it work. I wanted to include items with meaning to us, so the nick-nacks are all for a reason. The picture in the frame is of my husband’s mom and aunt when they were kids. 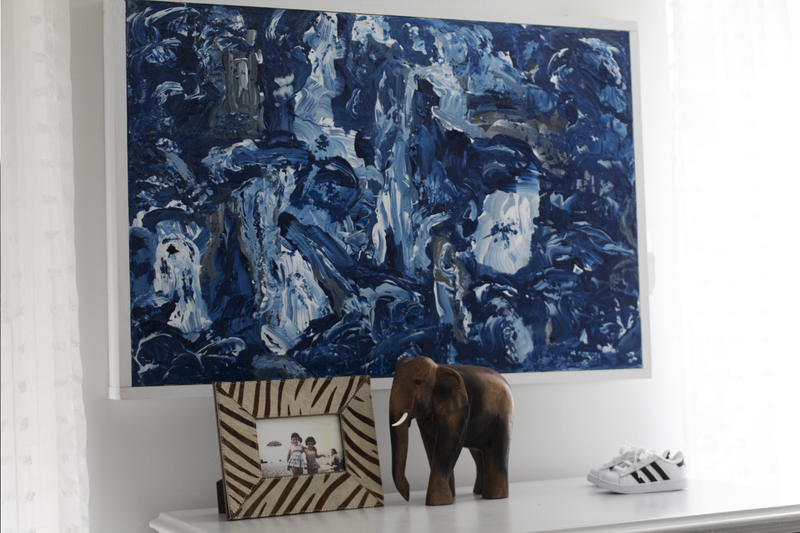 I loved that the frame plays off the natural elements of the room, including the wood elephant, which was given to us by the owner of the most magical boutique hotel in Thailand, after we bonded with him and his staff suspected we were expecting before we even knew! The Adidas kicks were too cute to keep in a closet until he’s old enough to wear. One of my favorite clients to work for threw me a baby shower during lunch on a photoshoot and they knew this stylist would appreciate it. I can’t wait until we can all wear our Adidas sneakers together, but until then, it’s part of the decor. 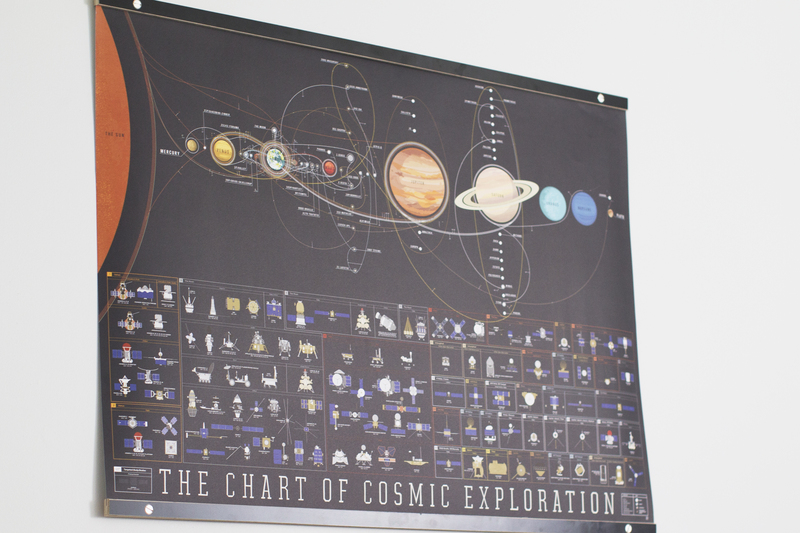 The number one item I wanted for this room were these vintage prints of space scenes that were in my father’s office for as long as I could remember. After much convincing, he kindly framed them for me for the room. I can’t wait to teach our boy about what his “Poppy” worked on. Speaking of teaching, this illuminated globe is both educational and functional. I grew up with a light up globe in my bedroom and it was one of my favorite things in my childhood bedroom. I hope as we use it as a nightlight, our son will enjoy it the same. 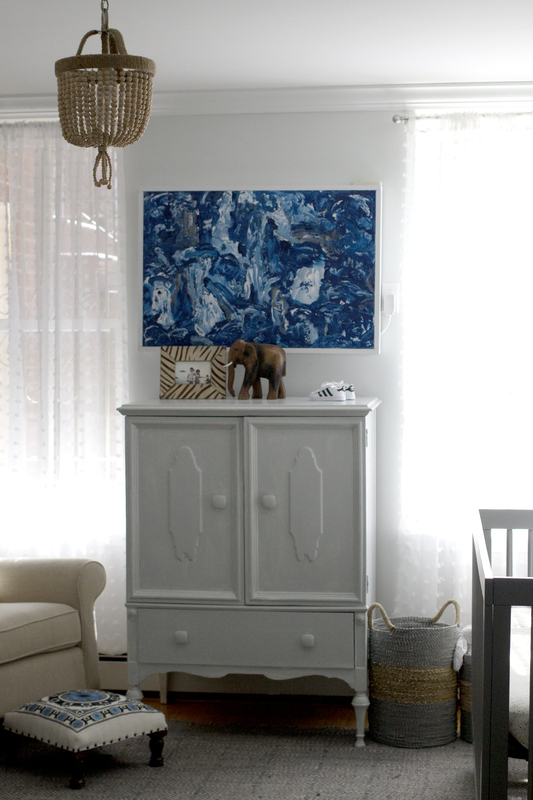 I also wanted a great dresser that had quite a bit of storage and can also function as a changing table. 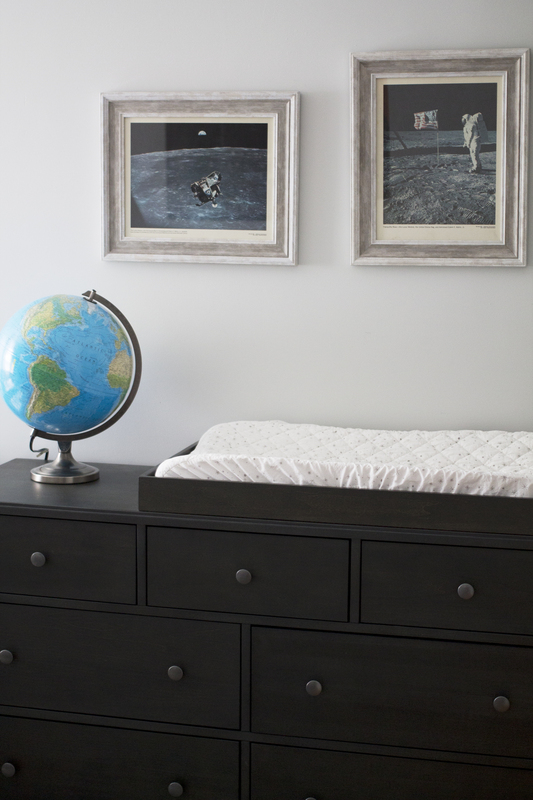 I loved the changing table/dresser set from Land of Nod because it’s something that will grow with him as he gets older, especially as the quality is so good. This poster was one of the most impulsive buys we had for this room, but it was so worth it. We both love anything that’s both decorative and educational, especially as the hubby works in education. We spotted this poster at Modern Anthology in our Brooklyn neighborhood and decided it was perfect for the room, not to mention we can point to the inventions that his “Poppy” worked on. It’s currently hanging over the silver framed guest bed, so it ties the room together. This crib was a design splurge, but it’s something we will get quite a bit of use of, as he will grow with it. The base can drop down for when he is able to stand, and then the front panel can be replaced by a bed rail for a toddler bed option. 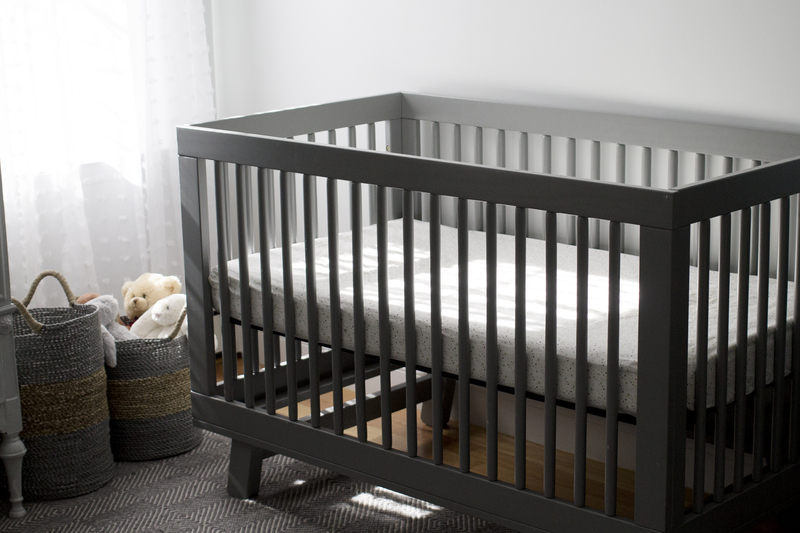 Now that bumpers and any items INSIDE a crib are not advised, it was important to me that the crib design was strong on its own. I got lucky and found this one second hand, but I would say this is worth every penny to pay full price as you will likely get a lot of use out of it. It’s important to me in my designer eye that everything has a function and everything has a place. I wanted baby blankets, stuffed animals and even laundry to be easily accessible to all, but still put away. 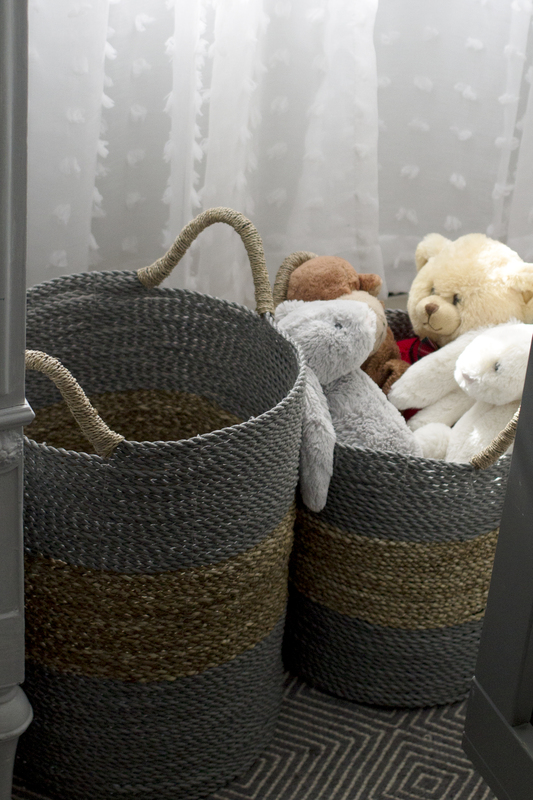 These beautiful, yet affordable baskets did the job. The colors also happened to tie into the room colors, so they work perfectly—for a price that doesn’t hurt my diaper money fund. Serene and simply magical. Your boy will dream sweetly here. Thanks for your post. I understand that you are very excited to be a mother. Really you decorated your room nicely. I must appreciate your taste. However what do think regarding the toxic in paints. What type of paint should we use to avoid toxicity? Hi Karen, thanks for you following along in my journey as a new mom! I had the same concerns. I talked to the folks at my local Benjamin Moore about that and they actually now carry a special eco paint that is safe for pregnancy and children. The color we wanted (Horizon) was able to be mixed with that formula. Best of luck!